iPhone Camera Versus Consumer Camera Versus Pro: Can You Tell the Difference? 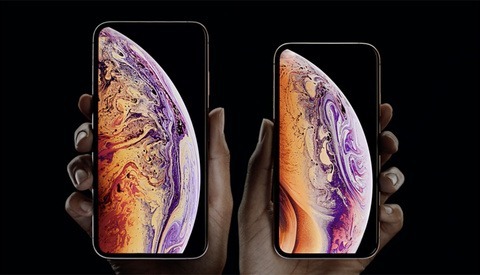 With every new generation of class-leading camera phones comes new claims of their ability to compete with professional-quality camera equipment. 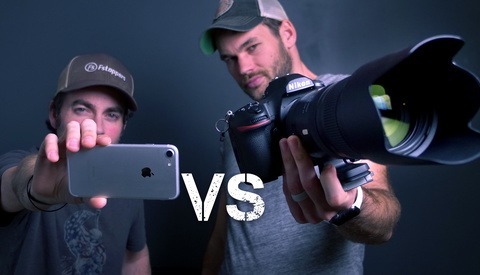 In this short test, the Northrups puts the brand new iPhone XS head to head with a consumer DSLR with a kit lens and a top-end Nikon boasting some super-sharp glass. Tony is quick to identify the iPhone XS as its wider lens (a full-frame DSLR equivalent of around 26mm) is far from flattering when it comes to shooting portraits. Chelsea would have been much closer to the model when shooting in order to fill the frame in order to match the other shots, and this shorter distance between lens and subject tends to distort a subject's features. In this instance, the wider angle lens means lengthening the nose exaggerating the forehead and narrowing the face. To some — like Tony — the difference in the quality of each image will be vast. To others — like Chelsea — the fact that most people won't be able to tell the difference on Instagram and won't care too much about the difference when printing an 8 by 10, means that the cheaper equipment is more than adequate. I can see it both ways: I can happily shoot soft images on my insanely cheap Yongnuo nifty fifty, but my OCD means that a framed portrait hanging on a wall with eyes that are out of focus drives me slightly insane. So, how does the iPhone stack up against the Nikon D850, and in turn, how does that compare to the Nikon D3400? Let us know your thoughts in the comments. Is the iPhone 8’s Camera Really That Good? I wonder why Chelsea didn't use the telephoto lens on the iPhone. Would've made a better comparison. However, I loathe "benchmarks" where the camera phone is the default. So many scenarios where a phone wouldn't keep up with a mirrorless or DSLR. I agree with Tony on the 'less detail can be preferable', and that's one good thing about phones. Just a guess, but most people shooting with a phone just grab it out of their pocket and shoot. That would make their comparison shot legitimate. For someone that has studied all of the capabilities of a phone, he or she would have played with the options if time permitted and probably gotten a better shot. In the end, the pro gear is best, but for most shooters, something like a D7200 or 80D would probably make for a very good choice in cameras as the better compromise between the phone and the D850. "Just a guess, but most people shooting with a phone just grab it out of their pocket and shoot. That would make their comparison shot legitimate." Yes, but this video didn't show that. My criticism is mostly aimed at videos where they put iPhone up against like a RED, but the RED has to be restricted to the capabilities of the iPhone - e.g. optics, lighting, etc. It's cool to see how far we've in phone quality, but it's a bit deceiving to say that it can replace "real cameras", except under certain conditions - like a bright day outside and wide-angle would be sufficient. I completely understand your thought process, but those of us here have a bit of a different viewpoint of what we expect from photography. For most people using phones, the results are good enough and as long as their results are good enough, they won't be the one's coming to FS to improve their photography. good comparison and logical reasoning by Tony. The wide angle look that people get with iphones or wide angle lens when you don't know what you are doing with it is very obvious. That why we have portrait lenses of course. In my early days of photography I took a picture of a bride's face in close up,front on with a 50mm lens. She said that doesn't look like me.She was right. My first real lesson in distortian.Notwithstanding all this the phone is great to have if you don't have a real camera with you and you just want to capture the moment. Next up cutting a steak with a butter knife, a boning knife, and a steak knife. Can you tell the difference? Pro tip: All of these questions are rhetorical. A definition for those of us who might not necessarily know. "A rhetorical question is a device used to persuade or subtly influence the audience. ... Oftentimes, a rhetorical question is used to emphasize a point or just to get the audience thinking. Sometimes, a rhetorical question is asked with the asker already knowing the answer" Well it did get those of us who replied to think.